In our article on Horizontal Menu and Navigation Bar, we have given you a how-to guide on adding a horizontal navigation bar into the Blog template. This Navbar can be text links, image links, or both. Since they are navigation tools, they should be somewhere at the top of the page and easily noticeable. You may have a background image in the Header and after adding the Navbar, you find the Navbar sitting at the top or bottom of the Header. Perhaps you want the Navbar somewhere in the middle of the image instead. In this article, we shall explore further customization tips on aligning the Navigation Bar and moving it to the exact position within the Header. If you want the Navbar further to the right, put a negative value to the right margin setting. Similarly, if you want to shift the Navbar to the left, indicate a negative left margin setting. Since image sizes and template styles differ, you would have to try out different margin values to find an optimum setting for your template. Preview the template to see the new layout. 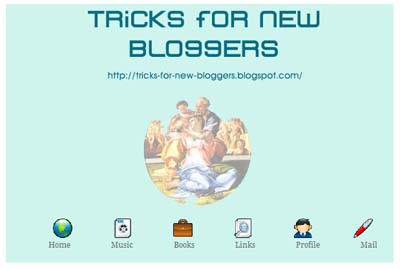 Once you have added the Navigation Bar, you would notice that it is positioned immediately after the Blog Description, and it is within the Header image. This time, we want to shift it down, so we add a positive value to the top margin. There we have it, a full Header image, and the horizontal Navigation Bar at our desired position within the image. First let me say thank you for building such a geat site. It has helped me a lot!! Second, how can I align the navigation bar to the left? I want it to fit above my posts. My url is http://livemorewantless.blogspot.com. Thanks! Thanks for ALL the tutorials, you guys!! I've been looking for this kind of stuff on the net forever. Anyway, could you maybe have a tutorial on how to get, like, custom bullets and whatever in the sidebar, and also how to get a three-column template? is it possible to change the font size of individual text of the horizontal navigation bar? This is very useful; thanks a lot! However, I have a question. I noticed that on both my blog and the screen-capture of what the blog should look like with the code, the navbar is shifted slightly to the right. Is there any way to fix this? In my experience, this tutorial is only good for the navigation bar to be placed at the bottom of the header. What if I want my navigation bar to be on the top of the header, not the bottom, what changes in html do I need to make? I love this website:) Thank you soo much for making these amazing tutorials. You helped me soo much in redesigning my website zixpk.com. 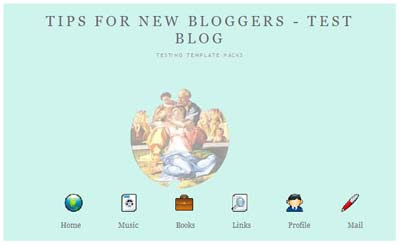 I used your method to put a navigation bar on my site, http://www.justbloggled.com. It shows perfectly in Firefox, Opera, and Safari. However, in IE7, there is a space between my header (with the nav. bar within the header) and the sidebar and main wrappers. Do you know how I can fix this? Personally, I never use IE but my readers might. Thanks, by the way, for your site. I use it constantly. How about showing a working example? (along with your screen shots) ? since you didn't use this in your own blog header. Antes que nada, mil disculpas por comentar en mi lengua nativa, pero mi ingles no es tan fluido al intentar expresarme. Y como deseo ser bastante claro, lo he preferido. He encontrado cosas interesantes en tu blog que me han servido muchísimo. Gracias por compartir. Tengo un pequeño problema y agradecería tu ayuda. La cabecera de mi blog la borre y fue cambiada por un banner hace días. Encime de el y siguiendo tus indicaciones de un post...he puesto el menú horizontal encima del banner e incluso le agregué una imagen de fondo para que las imagenes de enlace no se vieran tan flotantes. El asuntos es que el banner tiene en su margen superior izquierda unas letras que dicen que fue creado por una versión de prueba y me gustaría taparlas con la barra de menú. Lo he intentado de varias formas y no he podido. Si te queda fácil en pasar por el blog ( http://www.urositos-club.blogspot.com ) y mirar que solución se le puede dar me haces un gran favor. Saludos y nuevamente gracias por toda la información que das. I am trying to put my links menu at the bottom part of my header. However the header image is staying in the foreground, with the links behind it. 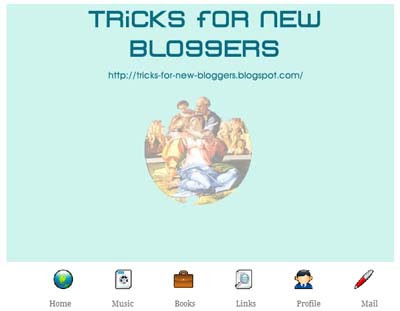 2) the title of the blog appeared as text over the header image. My bar keeps going behind my header. So can't see it. any ideas?? I used this method and it looks great in firefox and chrome, but the bar is off to one side in IE and safari. if you want to look at the thing directly. I'm having problems with getting all my icons in the navbar on the same line - why can't all 5 of my icons fit in? I've tried messing around with the margins/padding but to no avail! great site! thank you very much.. Thank you so much! Your instructions are so easy to do. I have a question though. I'd like to have some sort of an actual bar on the navigation bar, I was thinking more of the background color but with a bit of transparency on it just so I can still see the header image. I tried putting a "bar" on the navi menu but the background image/color stays just behind the texts. HI, THANK YOU FOR THIS BLOG,IT IS SO HELPFULL, BUT I NEED YOUR HELP!!! Let me just say that I could not do this blogging stuff with out your site. I've used you for a few different occasions, and I always feel like I can do anything after you help me change up my blog. Thank you so much for sharing information! I want to put a navigation bar instead of "new post"and"older post". AWESOME!!!!! Thanks so much for your info it really worked great for me.